To say I'm distracted lately is a bit of an understatement. Between homework, staying on top of bills, Spring Break going on this week, laundry, a basement that still needs to finish getting Finished, my mile-long to-do list, and... what else... oh yeah, this blog, my brain seems to always be a whirling storm of loose ends, forgotten commitments, and tasks to keeps track of. Sometimes I feel completely disconnected from my real life, even when I'm totally immersed in my Real Life by trying to get Real Things accomplished, because I'm rarely doing just one thing. When you're overwhelmed, multitasking is key. I could go on, but you know the drill - I'm certainly not the only one with a full dance card. I'm not the only person who's had back-to-back panic attacks - one for the length of your to-do list, then another one when you remember an errand that wasn't on the list and you wonder, "If I forget about that, what else am I forgetting???" I'm not alone when I feel like there aren't enough hours between now and the sweet, sweet release of death to fulfill even half my obligations. And I'm quite sure there are plenty of parents torn between taking care of their Grown Up Responsibilities and the guilt of not taking time to construct Lego fortresses and frolic at the playground all day long. Yet though I know this is true, I can't help feeling like everyone else has it all pulled together, or at least they've somehow managed to create the illusion that they're not drowning in a sea of Shoulds and Need Tos and I'd Betters. This is the part I'm missing - I'm pretty transparent when it comes to trying to do too much at once. I'm not fooling anyone into thinking I have it all pulled together, or that I even have two or three things pulled into the same zip code. Zoe called this to my attention recently. 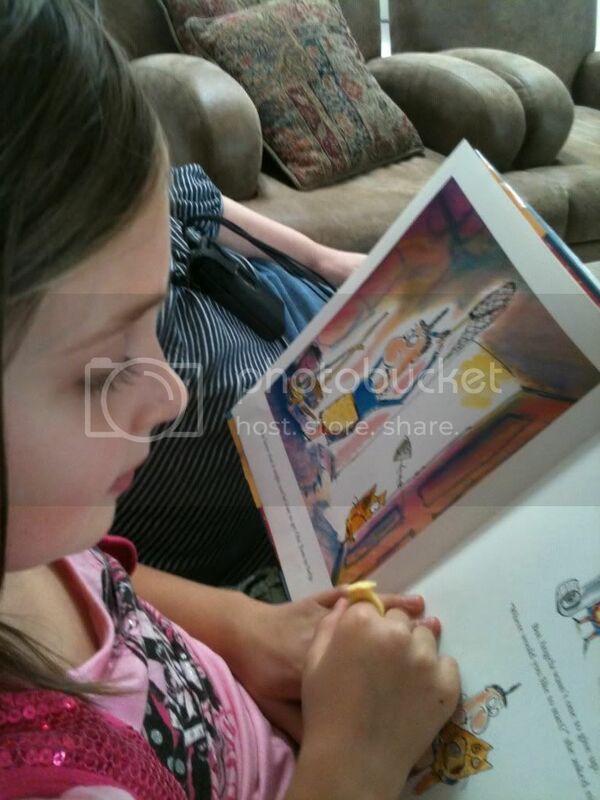 My kids love to read (I know - SHOCKER - a mom expounding on what Great Little Readers her precious angels are), and Zoe especially is still at the age when she wants to show you how much she loves to read by doing it out loud. If she had her way she would read out loud to me pretty much all day, pausing occasionally to gallop around the house on Butterscotch, ask for more string cheese, and change into a different set of dress-up clothes. Of course I don't want to discourage her, so pleas of, "Mommy, can I read this to you?" are always met with, "Sure, honey!" "...and then they put a hot tub out in the yard and drank it," Zoe read. Huh? I don't remember that part of the story from the first eleventy times I heard it. "What was that?" I asked. "Nothing," Zoe said, glancing up at me from the pages of her book. "I was just seeing if you were paying attention." So today I'm going to unplug a little bit. I officially give myself permission to check my email once a day (let's not be ridiculous) every hour instead of every five minutes. When Gerry tells me about one of his crazy ideas or rewinds the DVR so I can see someone's 80's hair while I'm commenting on blogs, I will briefly pause and make actual eye contact when I thoughtfully respond, "Oh, uh-huh? Is that right? You don't say." When I go online to pay the mortgage, I'll do my best not to get sidetracked and end up spending two hours looking for images to use in a blog post I may or may not ever even write. I'll let you know how it goes. You know, in a few minutes when I'm back on the computer, updating my Amazon Mom orders and listening to the kids tell me about what just happened on SpongeBob. You definitely need to give yourself a break. You're raising humans, AND get all that other stuff done? Pfft. I only vaguely take care of a dog and sometimes a husband and still don't get near as accomplished! Also, I don't proofread enough to get stuff accomplished. I literally laughed out loud at this. HILARIOUS. And oh so relate-able!!! This is one of my favorite posts ever. LOVE! @tumbleweed, you always make me laugh! :D Plus I love how you give me tons of slack for raising these little people (though sometimes I wonder about them being humans). @idiosyncraticeye, you'd think I'd be better at it after doing it for so long! Hey Erin, I don't mean to take any pleasure in your difficulties, but I admit I got a good laugh out of the sock bin! :) I soooo know how that is - I would love to condense all the things that mock me in this house down to a bin. ;) I had a great time that day, hanging out with the kids and not checking email (much), though the activities we did during Together Time were taken off my to-do list, so I'm not sure it really counts as totally unplugging..
@PishPosh, I don't blame you - it's not easy! Not that I would know. But I BET it isn't easy. I respect that you push to get it all done. But I also appreciate that you realize when it's time to stop pushing for a bit. I hate that twitchy feeling when my kids are talking to me. So hard to keep it at bay. The juggling is hard. And constant. But it's a fine line because I find if I cut back too much I get bored and depressed. @Christine, I'm glad I'm not the only one getting twitchy - and I feel SO GUILTY about it! You're right, though, about the balance - not enough to do is just as bad! I bet if you took a poll, a majority would say you have it pulled together and if they don't, then I am popping a bottle of champagne for you. I am not that organized and I feel like I am barely hanging on, yet, I have always maintained the image of a super woman. And you know what that has gotten me?? More SH*T to do. I celebrate you and now want to know where you live so that we can celebrate our foibles together and not make eye contact as we check our twitter feeds on the sly. BTW, I honestly and ironically checked twitter and responded to your retweet while waiting for this post to load (you know that 25 seconds is crucial). Hey Ellen, I never thought about the dangers of LOOKING like I have my shizz together - the last thing I need is anyone thinking of me as the mom who can handle one more bake sale! It's all an illusion - those who seem to have it all together - multi-tasking their days. I don't have kids and still my list never seems to end. I love your examples of Oh, you don't say and how your daughter tested you. Sweet and funny. Keep at it as there will always be eleventy million things to do.. Isn't multitasking a given when you're a mother? I loved this post because all of us can identify with some part of it. I hear you on the to-do list. I like to keep mine in my head so that I can panic about not doing things. Stress is so great, right? @B4Steph that is certainly comforting that it's an illusion - I hate to admit it, but I do take a certain guilty pleasure in imagining that the Together Mom at the playground is screaming inside her head, too. :) Thanks for being here! @Ellen, put it on an 80s cassette tape and it's a date! @Tracy, I love your checklist - perfect! And yes, I don't know what on Earth would motivate me if not stress, which is why I'm afraid to let up on myself. What if I relaxed and found out that underneath it all, I just don't care?!!? Then NOTHING would ever get done! "sweet sweet release of death" loved that! glad i'm not the only one who has thought that! this is really awesome - if it makes you feel better, i only have one human to deal with (two, i guess, if you count the husband) and i'm lucky if i get a shower in before three p.m. well played! I so, so get this. I don't have babies anymore, but the trying to fit it all in and staying on top of the game and... you get it. It can get crazy. I totally get it. In fact I had a whole post dedicated to my superior lack of time management skills just the other day. I can never get everything done that needs to be done. I need a magic wand... and a fairy godmother. Know any? @Heidi, thanks - good advice. Deeeep breathhhhs. Ahhhh. Thanks so much for reading and commenting! @Delilah, I wish!!! I know you and I are on the same page; we both just need to hang in there, right? I mean, it'll get easier at some point, right? RIGHT? @Bridget, I hear ya. I sway back and forth from stressing that I'm not going to get everything done, to stressing that I'm missing TODAY because I'm so busy getting things done. Or the worst - I miss out on my kids' childhood in favor of chipping away at my to-do list and it STILL never nears completion. Double fail! @Stephanie, you. are. BRILLIANT!!! You're right, they love reading AND they love gadgets - that's perfect! I even have one of those mini recorders, but of course I'll have to get another one anyway because if I give an awesome gadget (or a non-awesome gadget, or a used piece of chewing gum) to just one of them, the other will throw a fit, and that's even worse than the reading!